A Soyuz rocket intended to carry a Russian cosmonaut and a US astronaut failed during launch and plummeted back to Earth in the skies above Kazakhstan on Thursday morning. Rescuers maintained contact and reached the men, then helicoptered them back to safety. The rocket’s boosters failed high in Earth’s atmosphere en route to the International Space Station, forcing the crew to make an emergency landing. Russia has launched a criminal investigation into the rocket failure. A Soyuz rocket intended to carry a Russian cosmonaut, Alexey Ovchinin, and a US astronaut, Nick Hague, failed during launch and plummeted back to Earth in the skies above Kazakhstan on Thursday morning. 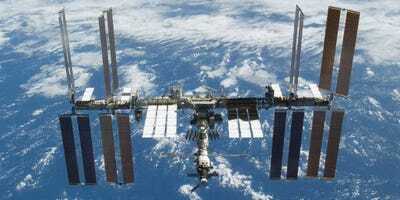 The US has access to the space station only via Russia’s Soyuz rocket, which has been dependable in the past. NASA said the crew was safe and was making an emergency landing in Kazakhstan, where the unsuccessful launch took place. “A thorough investigation into the cause of the incident will be conducted,” NASA Administrator Jim Bridenstine tweeted. “The crew is returning to Earth in a ballistic descent mode,”NASA said in a tweet earlier Thursday, adding that the descent would take place at a steeper angle than usual but that rescue crews were en route to the expected scene of the landing. Video of the incident shows the boosters abruptly quitting and the men being violently jerked around in the spaceship. The crew remains in good condition and in touch with ground rescue teams, according to NASA. International groups of astronauts often accompany one another to the ISS in joint launches. Watch live updates from NASA here. Following the failure of the Russian rocket, Moscow launched a criminal investigation into the Soyuz, Sky News reported. Space travel represents one of the few areas of cooperation left in strained US-Russian relations. In September, Dmitry Rogozin, the head of Russia’s Roscosmos space agency, said that a hole found drilled in a Soyuz rocket module at the ISS was possibly sabotage.